Reluctant senators still saying, ‘no, unless …’, but does Fitzgerald have the numbers? [Madison, Wis…] The answer is still no. Three conservative senators say they are prepared to vote against the Republican-led budget, a $75.7 billion, two-year spending plan that isn’t conservative enough for their liking. They have presented to leadership a list of nine items they want in the budget in order to secure their votes. They say they don’t need everything on the list. As of late Thursday morning, Sens. Chris Kapenga (R-Delafield), Steve Nass (R-Whitewater), and Duey Stroebel (R-Saukville) remained in the no camp. Sen. Robert Cowles (R-Green Bay), once a solid no, is now leaning yes, sources tell MacIver News Service. That would get Sen. Majority Leader Scott Fitzgerald (R-Juneau) to 16 votes. He needs 17. Sen. Dave Craig (R-Town of Vernon) tells MacIver News Service he’s still uncomfortable with the spending in the budget. Meanwhile, Assembly Speaker Robin Vos (R-Rochester) made clear late Wednesday night, moments before his GOP-led house passed the long-awaited 2017-19 state budget, that the bill would not be held “hostage” to renegade senators. “We will not be coming back next week,” Vos said. Fitzgerald acknowledged Wednesday afternoon he did not have the votes to pass the budget but that he was “optimistic” he would find them by the time the Senate clocked in Friday morning for its budget debate. He had scheduled debate as of early Thursday afternoon, and Fitzgerald is not one to take up a bill without knowing what he’s got. Mike Mikalsen, spokesman for Nass, said the reluctant Republicans have not ruled out a yes vote. The “no vote for now” senators want equality for statewide school choice, reforms to the troubled Department of Transportation and other changes in return for their support for the budget. In fact, they have a list of demands. The senators want to amend a Joint Finance Commission provision that expands income eligibility for the statewide school choice program to 220 percent of the Federal Poverty Level. They’d like to expand eligibility even further, to 300 percent – the same level as in the Milwaukee and Racine parental choice programs. Also on the list is a language revision that would prohibit the University of Wisconsin System from spending an anticipated $4 million on mandatory diversity, sensitivity, and cultural fluency training for students, faculty, and staff. Stroebel in particular is calling for an amendment that would add a provision from Senate Republicans changing Joint Finance Committee language on school referenda. 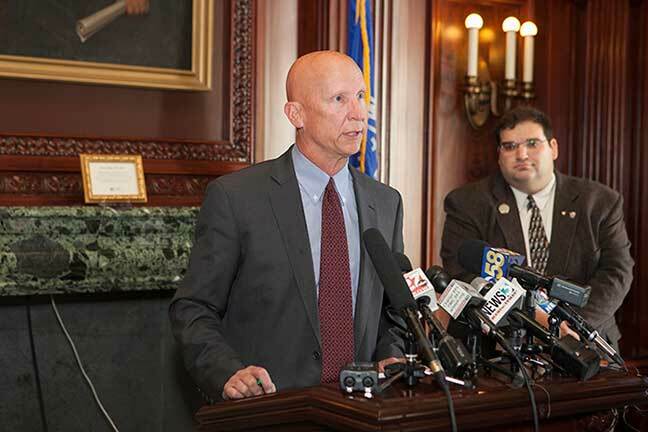 And the senators want checks on a runaway law that has allowed Wisconsin school districts to raise more than $217 million in new taxes (according to the Milwaukee Journal Sentinel) ostensibly for so-called green projects, without voter approval. The reluctant Republicans have several concerns on the transportation front. They want an amendment to a bill requiring local referenda to impose a wheel tax. And the senators are seeking implementation of a federal swap initiative in which a portion of federal transportation funds within local programs are swapped with existing state transportation dollars. Stroebel has been pushing for the change for years, asserting it would remove burdensome, expensive and ineffectual regulations from local highway projects. The senators, too, are not happy with a Joint Finance Committee measure tucked in at the end of the budget-writing process that would prohibit stringent local regulations on quarry operations. Some conservatives are concerned that other industries, such as Wisconsin’s growing sand-mining trade, could face tougher local restrictions because of the specific language protecting just quarries. State Sen. Dave Craig, a Republican fiscal hawk from the Town of Vernon, is a flat no vote, according to legislative sources, as is Sen. Robert Cowles (R-Green Bay). Fitzgerald is a consummate vote-counter. With 20 Republicans to 13 Democrats, he’ll need to pick up a couple of the “no vote for now” conservatives to pass the budget and move it on to Gov. Scott Walker’s desk. Just how the majority leader will accomplish that remains to be seen. Fitzgerald’s office said Senate Republicans did not expect to caucus again Thursday, but there would be smaller meetings throughout the day.